Tsunamis are large waves of water usually triggered by an earthquake, explosion, or other event displacing a large amount of water. Out in the open ocean, tsunamis are typically harmless and unnoticeable to the naked eye. When they start, tsunami waves are small and wide; the height of the waves can be as small as a foot, and they can be hundreds of miles long and move very quickly, so they can pass practically unnoticed until they get to shallow water closer to land. But as the distance between the bottom of the ocean floor and the water gets smaller, these short, wide, fast waves compress into extremely high, powerful waves that wash onto land. Depending on the amount of energy involved, they can reach more than 100 feet in height. While these natural disasters do not often hit a populated location like Thailand, when they do so, the effects are devastating. The 2004 Tsunami, referred to as the 2004 Indian Ocean Tsunami, the 2004 Indonesian Tsunami, or the 2004 Boxing Day Tsunami, was one of the worst natural disasters in recorded history. It was triggered by an undersea earthquake with an estimated magnitude of between 9.1 to 9.3, making it the third most powerful quake ever recorded. The tsunami generated killed more than 230,000 people in Indonesia, Sri Lanka, India, and Thailand, displaced hundreds of thousands of people and caused billions of dollars in property damage. The tsunami hit Thailand's southwestern coast along the Andaman Sea, causing death and destruction from the northern border with Burma to the southern border with Malaysia. The hardest hit areas in terms of loss of life and property destruction were in Phang Nga, Phuket, and Krabi because they were the most developed and so most densely populated areas along the coast. The timing of the Tsunami, the morning after Christmas, intensified the loss of life striking the most popular tourist areas on Andaman Coast during peak vacation season and in the morning when many people were still in their homes or hotel rooms. Of the at least 5,000 people who died in Thailand, almost half were vacationing foreigners. Much of Phuket's west coast was heavily damaged by the tsunami, and most homes, hotels, restaurants and other structures on a low ground required significant repair or rebuilding. Some areas, including Khao Lak just north of Phuket in Phang Nga, were almost completely wiped out by the waves. Though Thailand suffered significant damage during the Tsunami, it was able to be rebuilt quickly compared to most other countries. Within two years virtually all the damage had been removed and the affected areas redeveloped and travelers to Phuket, Khao Lak, or Phi Phi will find little trace that the tsunami occurred. The Pacific Tsunami Warning Center, operated by the National Oceanic and Atmospheric Administration (NOAA), uses seismic data and a system of ocean buoys to monitor tsunami activity and issue bulletins, watches, and warnings about impending tsunamis in the Pacific basin. Because tsunamis do not strike land immediately after being generated (they can take as much as a few hours depending on the earthquake, type of tsunami and distance from land), if there is a system in place to quickly analyze the data and communicate danger to people on the ground, most will have time to get to higher ground. During the 2004 Tsunami, neither the quick data analysis nor the ground warning systems were in place, but since then countries involved have worked to remedy that shortcoming. 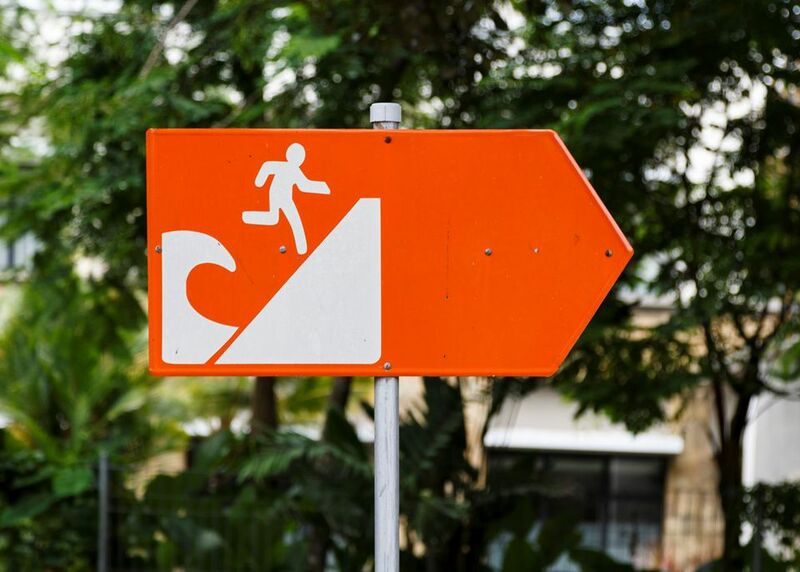 After the 2004 Tsunami, Thailand created a tsunami evacuation system with alarm towers along the coast, plus radio, television, and text message warnings and clearly marked evacuation routes in densely populated areas. In April 2012, a tsunami warning triggered by an earthquake in Indonesia was a major test of the effectiveness of the system. Though ultimately there was no massive tsunami, the early alert allowed for the government in Thailand to quickly evacuate those in all the potentially affected areas. The 2004 Tsunami was triggered by an earthquake likely the biggest the region had seen in 700 years, an exceptionally rare event. While smaller earthquakes could also trigger a tsunami if one were to occur visitors should be able to rely on the new systems in place to spot tsunamis and warn people to evacuate to safety.